The research, by Dr. Marina Davila-Ross and Ph.D. candidate Derry Taylor, both at the University of Portsmouth, is published in Scientific Reports. 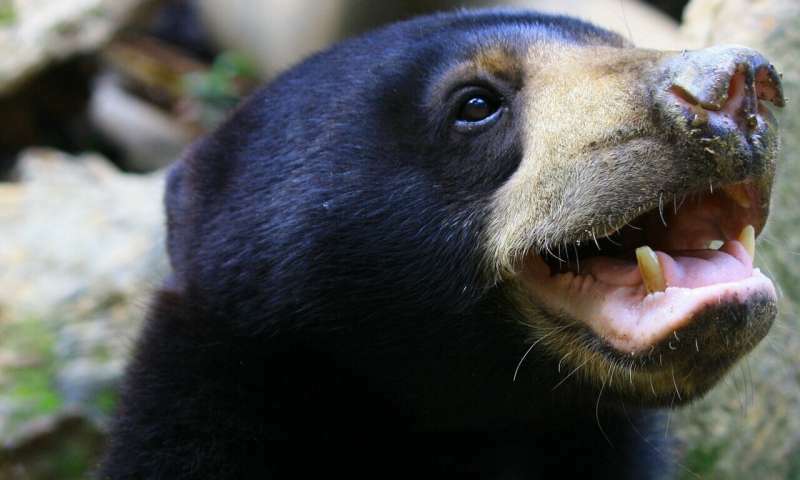 The researchers studied sun bears—a solitary species in the wild, but also surprisingly playful—for more than two years. Dr. Davila-Ross said: "Mimicking the facial expressions of others in exact ways is one of the pillars of human communication. Other primates and dogs are known to mimic each other, but only great apes and humans, and now sun bears, were previously known to show such complexity in their facial mimicry. During these encounters, the research team coded two distinct expressions—one involving a display of the upper incisor teeth, and one without. "That's what makes these results so fascinating—they are a non-social species who when face to face can communicate subtly and precisely." "...bears' facial expressions throw doubt on human superiority" - Really? How many world changing inventions do bears have? The only bears I could check the patent office on were Yogi and Smoky. Neither one has a patent listed. Successful manned voyages from Earth to the moon. Humans 6, Bears 0. I do understand that bears are much better at climbing trees than humans. It's not fair they have such big sharp claws! Sorry, Just having a little fun with the headline. I remember when bears invented the iPhone, and Steve Jobs stole their credit, and when they flew to the moon, and those pesky astronauts hogged all the glory. The best though, was when that half-man, half-bear, half-pig beast warned us all about global warming and AlGore made that movie that really pulled the rug out from under ManBearPig. Cats are remarkably expressive to someone who knows them well. But not so much facially; they use cues visible at longer distances, using their tails and body language, as well as their ears and their back posture. This type of somatic signalling is pervasive among mammals; mice who are erect with their front paws together are signalling aggression, for example. I am not astonished these bears have somatic signals and don't consider it particularly unusual in an animal with a large head carried well forward uses facial signals. And when a rhinoceros in a wild animal park approaches the side of the truck I'm riding in and opens its mouth, I throw in a chunk of apple the keepers gave me. I sure didn't need written instructions. Some clickbait relies on asininity to work. Like this one. OK, I'll play. Eagles see better and can fly, so they're superior to humans, dogs have better ears, cats see in the dark, horses run faster, no one has found a shark dead of old age...we have to build telescopes and airplanes and microphones and flashlights and cars, and we still may not live as long as sharks. It's a miracle we've survived natural selection...oh wait, we found a workaround for that. Maybe the article acknowledges that, but I don't care; since I don't like being manipulated by smartass editors I won't read it. Papa bear was found dejected and drunk from eating fermenting rotten apples. When asked why. He responded -- It's unbearable when her eyes say yes but the rest of her face say no. I'm astonished that Humans were smart enough to learn long-distance signalling from herding dogs. However that seems to be about the limit of Human learning capacity. Cause, as often & patiently dogs try to teach their humans to pick up their crap? The human just stands there looking away & finally rushes off. Precisely, strategerist and dkjack. These facial expressions are likely just the tip of the iceberg. Continued bear research will probably reveal their superiority to Rachmaninoff concertos, political debate, Dostoyevsky novels, space probes to Pluto, and stem cell research. I'd say bears are more intelligent than Dr. Marina Davila-Ross and Ph.D. candidate Derry Taylor but not so much for the rest of us. Humans are not "superior". The only thing about us that is "superior" is our ability to think we are "superior" and our ability to destroy huge sections of the environment with wanton abandon to suit our needs. Cell phones, computer, cars, etc. are not signs of intelligence, rather convenience. If we were truly intelligent, we as a species would realize 1) we are not the center of the universe, just an infinitesimally small part of it, 2) we are living in the Garden of Eden and every life in it is not ours to take or manipulate, and 3) intelligence has nothing to do with things and everything to do with the heart and the spirit. calling ourselves "Homo Sapient is rather a reach even for our bloated egos. would be a much more accurate classification. It is really humorous that comments are missing the point and confirming that they think humans have unique traits despite the evidence! Either by implying these types of finds are not an advance by injecting irrelevant chaff on technology and what not, or by implying humans are the only invading species there is.